A dense, green forest lines the riverbanks. Monkeys chatter in the trees. Off to the side, a big crocodile sticks its eyes and nose out of the water. This is what a boat trip on the Amazon River can be like. Be careful not to fall overboard! Fish called piranhas may be swimming near the boat. A group of piranhas can gobble up a large animal in minutes. The Amazon is a long river in South America. The river starts in snow and tiny streams, high in the Andes Mountains in Peru. Rainbows appear when the Sun is shining and it’s raining at the same time. That doesn’t happen very often. But you don’t have to wait to see rainbows—you can make them. It’s easy. Go out with a spray bottle on a sunny day. Stand with the Sun behind you and spray water into the air. You should see your very own rainbow! A rainbow is made by light bouncing back to you from the insides of raindrops. Ordinary light, like that from a light bulb or from the Sun, is called white light. White light is actually a mixture of seven colors. Light bends when it passes through water. Each color bends a different amount. When white light enters a raindrop, the colors get separated. The white light splits into seven colors that you can see. A tiny insect nibbles on some leaves. The insect skims over a lake. A little fish swimming below spots the insect on top of the water. The fish zooms up and eats the insect. Later, a slightly larger fish eats the little fish. Then, the slightly larger fish gets eaten by a really big fish. You are in a boat on the lake fishing. You catch the big fish, cook it, and eat it for dinner. 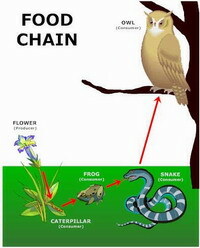 A food chain is the way energy goes from one living thing to another through food. Plants are the first step in most food chains. A hurricane is coming! Boards are nailed over big store windows. Families pack their cars and leave town. A hurricane is a powerful storm with pouring rains and strong winds. Hurricanes can do a lot of damage. They cause floods. They blow down trees. Windows break and roofs fly off of houses. Hurricanes start over the ocean. They form over warm water near the equator. The equator is an imaginary line that goes around the middle of the planet. Some hurricanes start in the North Atlantic Ocean, the Caribbean Sea, and the Gulf of Mexico. These hurricanes can strike the East Coast or Gulf Coast of the United States. Maybe you recycle cans, glass, and paper. Did you know that nature recycles, too? One of the things nature recycles is water. Water goes from the ocean, lakes, and rivers into the air. Water falls from the air as rain or snow. Rain or snow eventually find their way back to the ocean. Nature’s recycling program for water is called the water cycle. The water cycle has four stages: storage, evaporation, precipitation, and runoff. Most of the water on Earth is in the first stage, storage. Water on Earth gets stored in oceans, lakes, rivers, ice, and even underground. The oceans store the majority of this water.